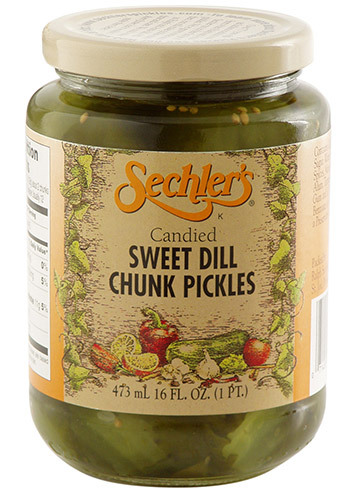 16 ounce Candied Sweet Dill Pickles are a 1/2 inch chunk pickle. Twice sweetened with pure sugar & dill flavor. From Art of Hood River, Oregon on 4/9/2019 . From Anonymous of Lawrence, Kansas on 3/24/2019 . Thank you Sechler for not only a great pickle, but also great service. From Albert Scott of Madison, Indiana on 10/22/2018 . WOW! These Candied Dill Chunks are FANTASTIC! We use to buy candied dill spears from Krogers until they discontinued the product. So glad we found Sechler's. I believe the balance of dill and sweetness is better than the Kroger product. From Albert Scott of Madison, Indiana on 8/16/2018 . Wow! What a joy to find someone who makes a candied dill product. People who haven't had them do not know what they are missing. Fantastic product! From Ged of Broken Arrow, Oklahoma on 3/12/2018 .